In Siro Taluka village in Kolhapur we have the idol of lord Ganesha placed inside the mosque. For the past 50-60 years we have been performing this ritual here. We have such idols in six to seven mosques. Hindu and Muslims take part in the immersion of the idol together. This way we are trying to spread this message of amity among the people of the whole country to live together in peace,” said Mansoor Sheikh, a Muslim devotee. “See, for the past 40-50 years we have been celebrating the festivals of Hindu and Muslims like Muharram (a Muslim festival), Ganpati, Navratri ( Hindu festivals) together with religious amity. We celebrate all these festivals together with brotherhood and love. No violence occurs here and we celebrate every festival with great fervor and zeal,” said Mahesh Janvekar, a Hindu devotee. 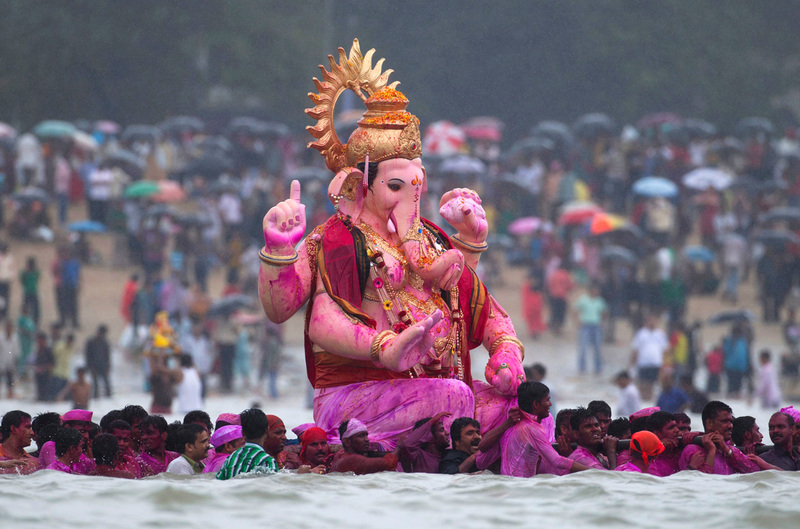 At the end of the 10-day-long festival, the idols of Lord Ganesha are taken in grand processions and immersed in water bodies such as wells, ponds, rivers and the sea. Ganesha Chaturthi is the most important festival in Maharashtra, and it is also celebrated with devotion in other states of southern India like Andhra Pradesh, Karnataka and Tamil Nadu.